Imagine you have a cheque to bank. It is for a reasonable amount of money and you need it in your account ASAP as you have money coming out soon for bills which this cheque is meant to cover. 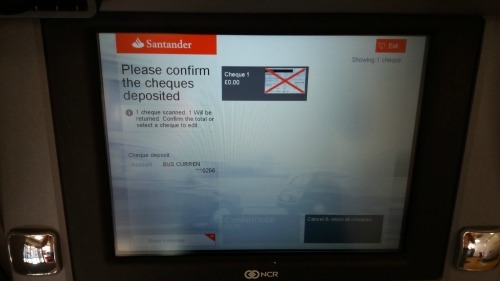 Imagine that your business account rules mean you can only bank your cheque via an ATM. The bank will not allow you to use the cashiers inside the bank to help you. I assume this is a cost cutting exercise. Imagine you get to your bank to find brand new ATM machines outside. New screens, new process. 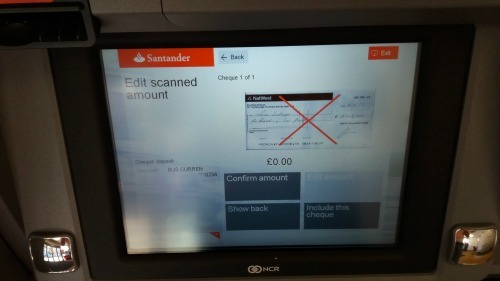 As far as you can see it will not allow you to bank your cheque as the handwriting is not clear enough for the new scanner to pick up. This happened to my husband. Frustrated and cross the only thing he could think to do was try a different branch to see if their ATM’s had also been switched. They had, but they were also open and one of the cashiers was kind enough to show him what to do. Finally get to the screen where I can edit the cheque and the edit button isn't activated! 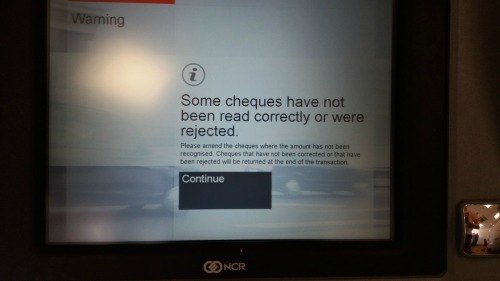 I cannot help but wonder what sort of testing went into these screens, which even the cashier (who came out to help) had had negative comments for. In these situations less really is more! The user should not have to think about what to do next. It should just flow. 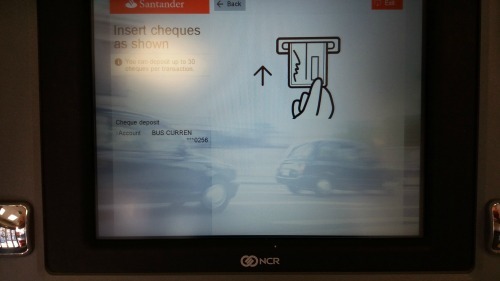 From the above screen would you know to click the 'Include this cheque' button to edit the cheque? When designing things which directly involve people’s money you have to be so careful. If the machine eats my husband's cheque and does not record it against his account it could be several weeks before he finally gets the money in his account. As a small business owner he cannot afford for that to happen. His suppliers will need their money and in some cases he cannot buy more with them until last month's bill is paid. His other concern is what to do with multiple cheques? He used to just put everything in one envelope and post it in the ATM. But now they are scanned he is not sure if he can scan more than one in a transaction or not. As he said “best not to risk it”. But this means he has to spend more time at the ATM. 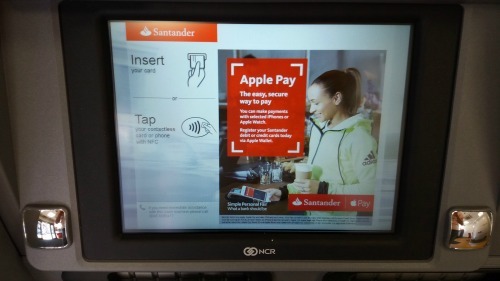 I am sure there are many constraints around these new ATM's and maybe further updates will be made. But I do not think this is the type of project which should be roled out 'unfinished' or on MVP (Minimum Viable Product).